The new RFX is Turner’s second foray into carbon, yet it retains many of the iconic visual cues associated with the iconic brand. 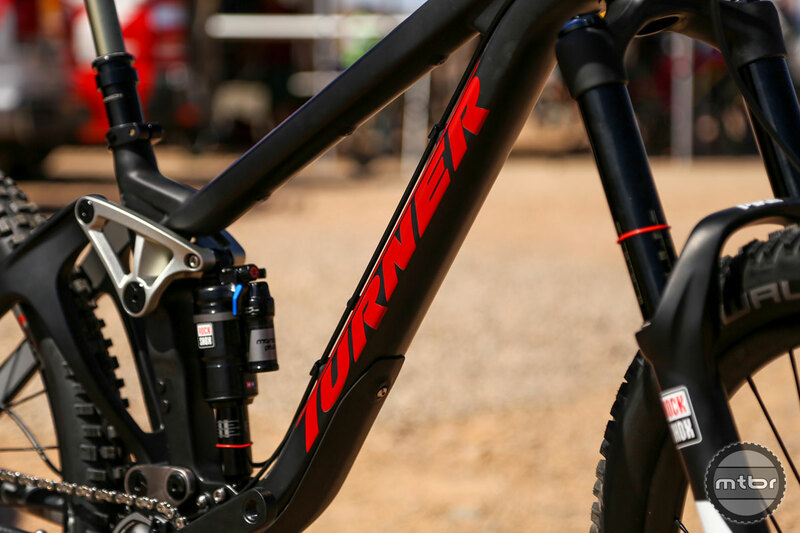 The new Turner RFX is the latest in a new breed of Enduro bikes that straddles the middle ground between hard charging EWS racer and versatile all mountain rig. Cable routing is largely external, although there are provisions for a stealth routed dropper post. 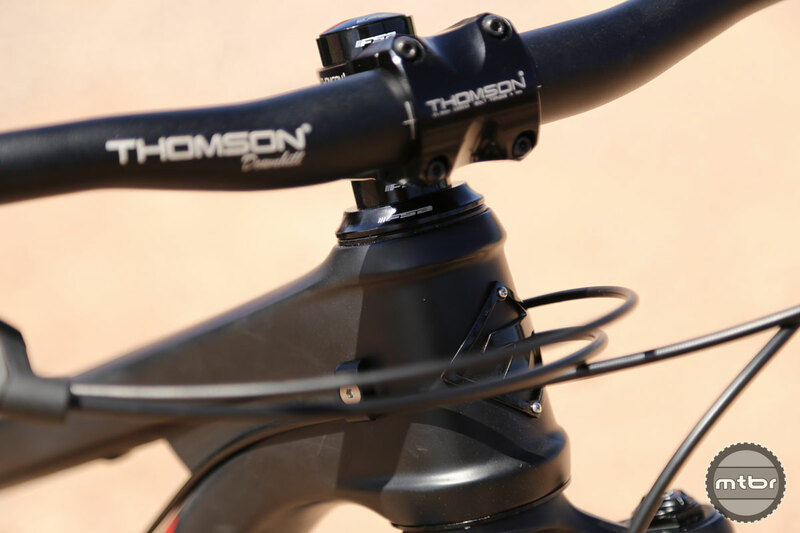 Designed around a 66° head tube angle in its stock configuration, the 160mm travel frame can be slacked (or steepened) by 1.5 degrees via the included 49/62mm angle adjust headset. Changes can be made in 5° increments and a kit with 5° / 1.0° / 1.5° headset cups are available directly from Turner Bikes. 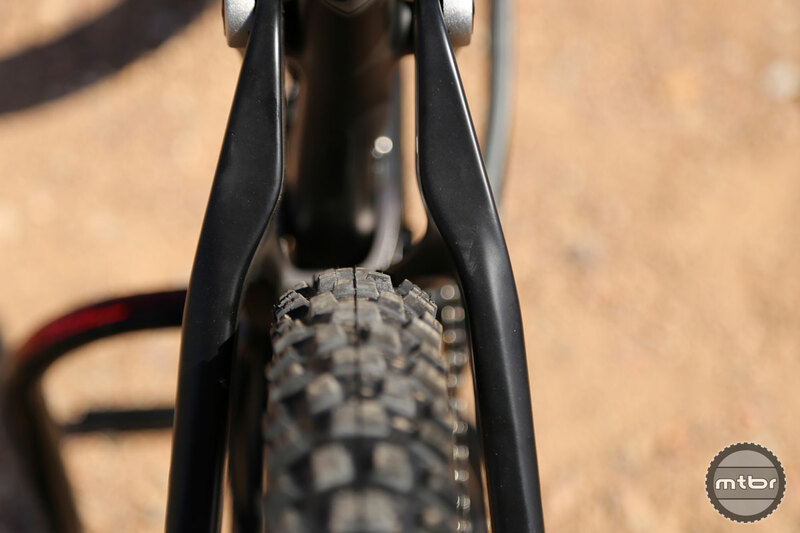 With the stock 160mm fork, the frame can be raked out to as much as 64.5°, or steepened up to 67.5° for riders more interested in a long legged trail bike. 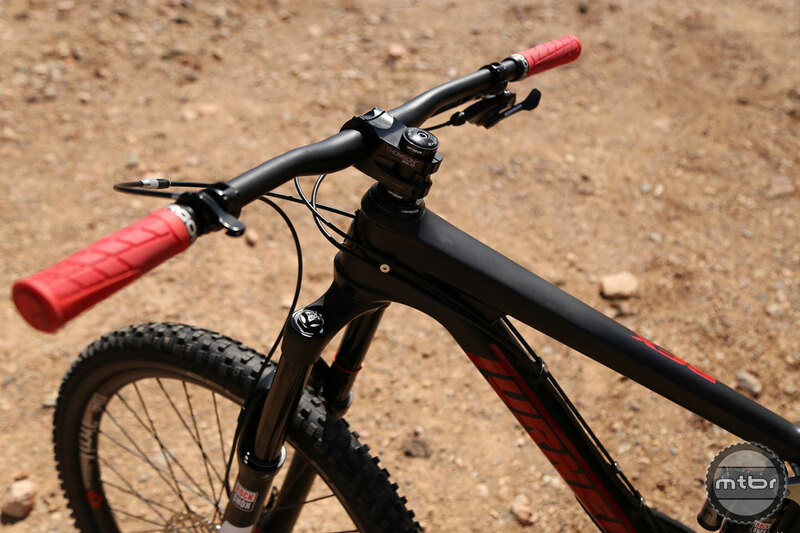 To help improve fit across the board, the RFX seat tube is compatible with 150mm dropper posts. 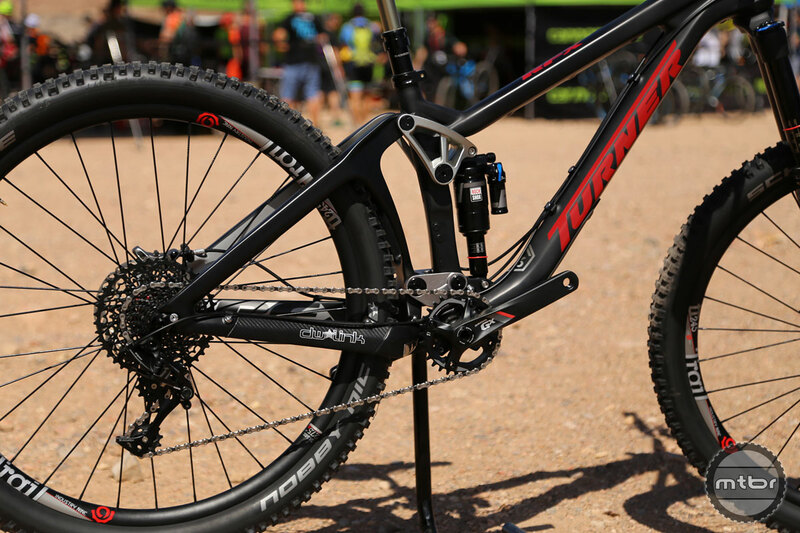 Like all full suspension Turner models, the RFX utilizes the DW-Link suspension, but will utilize the same style EnduroMax Cartridge Bearings found on the DHR. We’re happy to report the RFX utilizes a threaded bottom bracket! 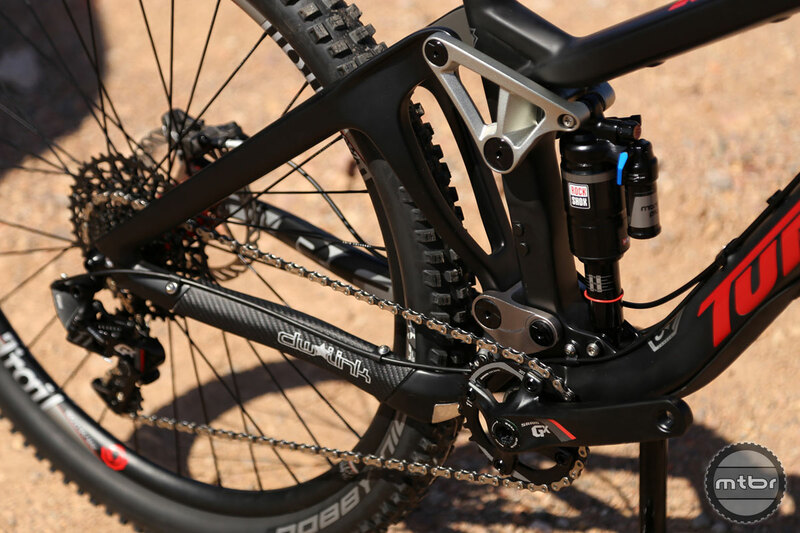 While many riders are now sold on 1x drivetrains, the frame has a removable direct mount adapter for riders who prefer 2x drivetrains. When not in use, the plate can be removed and the mounting ports covered with small caps for a clean look. Even with big 2.3” Schwalbe Nobby Nics installed front and rear, the RFX has plenty of tire clearance. The rear stays have clearance for a meaty 2.4” tire, plus a little extra for muddy days. The RFX will be available in four different sizes. During Outdoor Demo, both Gregg and I had the opportunity to take the new RFX for a short spin. The top tube is on the slightly shorter side of the current long and slack trend, but at 5’7, I didn’t feel cramped on the medium frame with a 50mm stem. Our demo unit was spec’d with a 160mm Pike, which was simple to setup, but the Monarch Plus Debonair shock was a bit more unusual. To achieve the recommended 30% sag, Dave Turner actually recommended running 30 PSI over your regular weight in the rear shock, which ended up being spot on. Suspension can be further tuned via volume spacers. Each frame will ship with three volume reducers installed in Debonair can, plus an additional five for fine tuning. Adding additional volume reducers will make the shock more progressive, while removing the reducers will help lighter riders make better use of all their travel. Dave Turner knows how to build winners. On the trail, the frame felt spot on with minimal suspension fiddling. I ran the shock fully open for almost the entire duration of my ride and was rewarded with a pedaling platform that felt efficient both in and out of the saddle. The lockout isn’t quite a full lockout, but it’s almost hardtail stiff, and the middle position is probably prime for shredding flow trails. The front end of the RFX comes up easily and it bunny hops much better than a bike of its travel ought too. Without looking at a geometry chart, I suspected the frame had longer chain stays due to how well it handled in the rocks, but the frame is surprisingly playful. It was easy to manual over small drops or get the back end sideways over hips. While it would require more familiar terrain and larger hits to really push the RFX, I came away impressed with the new Turner. The geometry may not be the slackest, or lowest, or longest, but it achieves a wonderful balance between those three needs. If you’re in the market for a versatile new enduro bike, I highly recommend you demo the new RFX. Build kits start at $4,573 and a full XTR build will set you back $6,533. A frame only option is also available for $2,995. For more information visit www.turnerbikes.com. 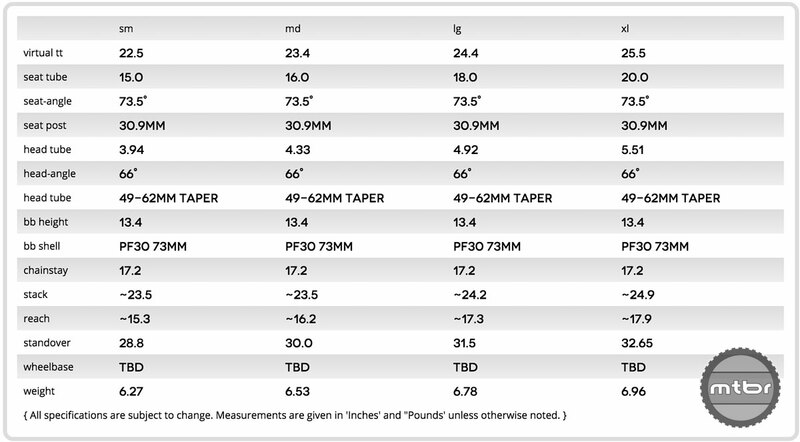 Checked out the Turner’s website, too bad all the weights for complete builds are TBD, but their frame weight of ~6.5 lbs is pretty competitive. Plus they’re surprisingly cheap. 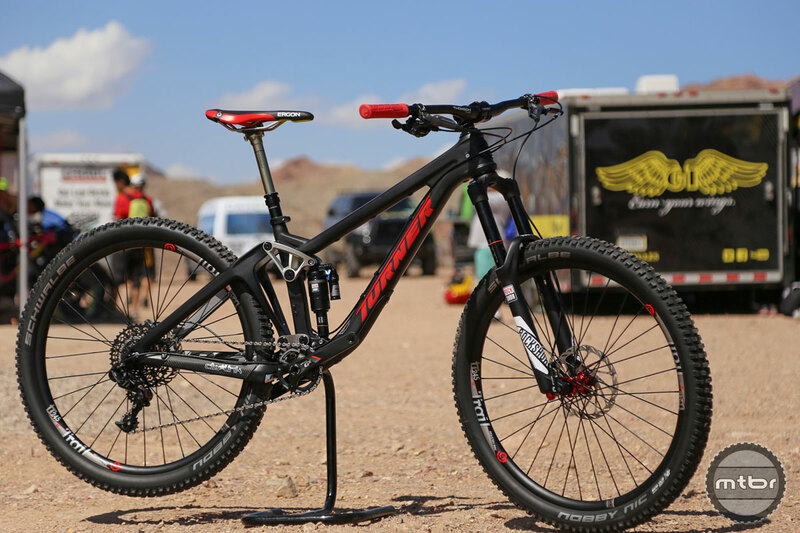 A full carbon bike with XTR and Enve wheels for under $10K? INCONCEIVABLE! Also it’s cool to see that they use Toray hi-mod cfrp. Toray is one of the better performing companies in terms of quality and consistency. They do lots of testing and engineering to back their products, so these Turner frames won’t be delicate. Can the media please stop with all of the rave RFX reviews! I just bought a Burner last spring and this is making me come down with a serious case of N+1 syndrome.